Have you been actively trying to conceive for the past 12 months or more to no avail? If you answered yes, then welcome to infertility. It’s a journey like no other. It’s one you never wanted to embark on, and it’s definitely one you don’t want to stay on for very long. But since you’re here, let this book be your traveling companion! 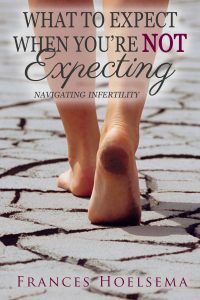 In What to Expect When You’re NOT Expecting: Navigating Infertility, Frances Hoelsema uses her own personal experiences, as well as those of many other women, to guide and inspire you on this ultra-frustrating, highly-emotional, and what feels like an extremely-lonely journey. If you’ve got questions…there are answers! If you need tips…plenty are provided! If you need someone to understand…these women do! If you’re feeling alone…be assured you’re not! Whether you’ve just begun your infertility journey, or have been on it for quite some time, there is something for everyone. From astounding statistics, to real life examples, to concrete sources of hope, this is one book you won’t want to be without. So sit tight and buckle up! The journey will be bumpy, but with What to Expect When You’re NOT Expecting: Navigating Infertility by your side, you’ve got this! Compared to other books in this market, it’s set at a great price, too! The book is available on paperback through Amazon or CreateSpace for just $12.99 OR in eBook format on Kindle for just $4.99! Now that the basics are out of the way, let me give you some background. This all started, honestly, in June of 2006. This is when my husband and I believed we were ready to get pregnant. We had been married a few months, had stable income, loved babies. Why not, right? However, the process wasn’t easy. Through treatments and one miscarriage, we thought our baby would never come. Almost four years later, thankfully, God answered our prayers. Since going through the heartache of trying to conceive, I’ve had a passion to come alongside women in the same shoes I was once in. Therefore, it was only natural for me to want to write something about it. First, however, I wanted to get done with my Neighbors series. The final book in that series was published in December, and immediately, I began formulating what I wanted this infertility book to be about. With the help of so many other women, it became what it is today. Up above is the cover of my book. And if you go to one of the retailer sites you can get a glimpse of the inside. 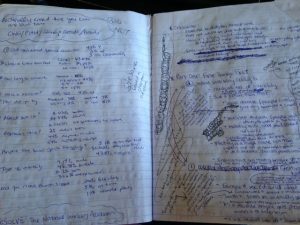 Here, however, is something you won’t see, but here…my notes! 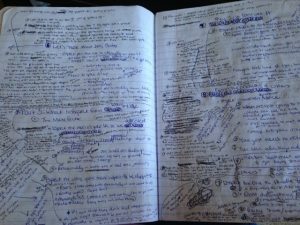 This is only a couple pages of the many I scribbled all over. You probably wonder how in the world I could make anything out of all this mess, but this is just how my brain works! I must admit, though, I am grateful it all came together and now is ready to share with the world. Please do me a favor and spread the word! I truly believe that this book will help those in the midst of this dark and oftentimes lonely tunnel. Thank you so much!